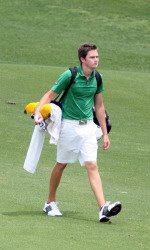 Charlotte junior Corey Nagy, the 2009 A-10 Golf Student-Athlete of the Year, and his 49ers teammate Stefan Wiedergruen, were among seven players from the Atlantic 10 Conference named Cleveland Golf/Srixon All-America Scholars announced by the Golf Coaches Association of America (GCAA). It's the second straight year Wiedergruen has earned the earned recognition. Nagy finished 36th overall at the 2009 NCAA Championship. He won the individual title at the 2009 A-10 Championship, helping Charlotte to its fourth straight league title. To qualify for the honor in Division I, the student-athlete must be a junior or senior academically, compete in at least two full years at the collegiate level, participate in 70-percent of his team's competitive rounds, have a stroke average under 76.0 and maintain a minimum cumulative grade-point average of 3.2. Congrats! Outstanding work both on the course and in the classroom! This program continues to be the pride of the school! Great work guys!